Today we left Boothbay Harbour to drive the 120 miles to Jackson in the White Mountains of New Hampshire. We stopped briefly in Wiscasset, which is a lovely New England town at the head of the Boothbay peninsula. After getting a bit lost, we eventually arrived at Jackson and had our first sight of one of New England’s covered bridges – the Honeymoon Bridge, built in 1876. After checking into the Eagle Mountain House, we visited the nearby Jackson Falls. These were really just a series of cascades on the Ellis River, but it was a pleasant enough spot. Back at the hotel, we discovered they had the very latest in telecommunications technology! Although the day started misty, it was forecast to clear up, so we decided to take the drive up Mt Washington – a ‘must do’ when visiting New Hampshire. On the way to the Mt Washington toll road, we stopped at a couple of waterfalls close to Pinkham Notch, first at Glen Ellis Falls, then at Crystal Cascades. Unfortunately for the latter, we turned back on reaching some minor cascades thinking they were the main falls. These are a bit further on, and are far more impressive, so more research required on our part! The Mt Washington toll road was first opened to the public in 1861 and climbs 4618 feet over a distance of 7.6 miles to reach the summit of Mt Washington (6288ft and the highest peak in the Northeastern United States). Included in the toll fee is a CD which can be played in the car to point out interesting facts and features during the ascent. 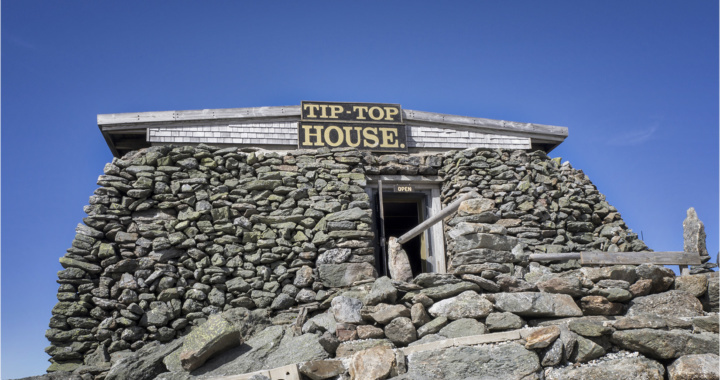 There are various buildings on the summit of Mt Washington, ranging from the Tip Top House (one of the original hostelries), the cog railway terminus, a large visitor centre and an observatory. The observatory is famous for being the site where the highest wind speed ever directly experienced by man was recorded on 12th April 1934 at 231mph – no wonder the observatory building is held down with chains! We were fortunate to visit during clear weather, with no sign of high winds, so we spent most of the day enjoying the extensive views and exploring the summit buildings. Today we decided to visit Flume Gorge, on the other (Western) side of the Presidential Range from Jackson. On the way along the Kancamagus Highway, we stopped to visit Sabbaday Falls, which are reached by a short 0.3 mile walk from the road. The falls are quite impressive, dropping 30ft in two stages into a narrow gorge. Carrying on to Flume Gorge, there is an admission fee at the Visitor Centre which gives access to a number of trails. The gorge is reached after crossing a lovely covered bridge over the Pemigwasset River, which was built in 1886. Further on, the gorge walls narrow and steepen, reaching 90 feet high and just 12 feet wide. At the head of the gorge, there is a close-up view of Avalanche Falls, which tumble 45ft into the gorge. Beyond Avalanche Falls, we continued on a 2 mile circular loop through the woods, also visiting the Sentinel Covered footbridge . After visiting Flume Gorge, we returned to Jackson by our outward route along the Kancamagus Highway, stopping off at Rocky Gorge on the Swift River. This is not really a gorge, but is an area of attractive coloured rocks beside the river where there was also a good display of autumn foliage.